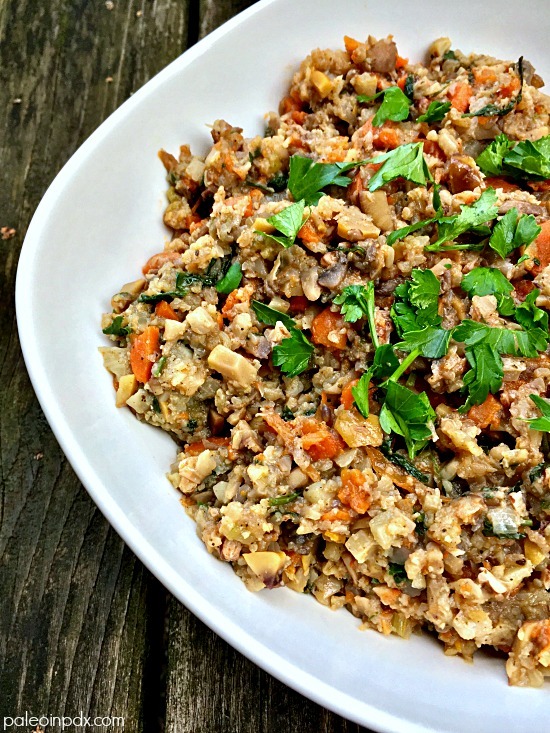 This grain-free “rice” stuffing is perfectly savory and tastes like Thanksgiving. Its flavor and texture is impeccable, and I can’t even fathom how incredible it would taste with turkey. It’s been amazing with chicken, and I think it would also pair well with mild fish, pork tenderloin, and even eggs. If you ask me, it’s a must-have side dish for the holiday season! Since this stuffing is not grain-based, it doesn’t leave you with that heavy belly, carb coma feeling. Instead, it’s veggie based, light, and leaves you feeling great. No stomach aches or fatigue! Meanwhile, I went back on KATU Afternoon Live recently and made my crustless butternut squash pie. Catch the replay of my segment HERE. Melt butter in a large pan over medium heat. Once melted, add the onion, celery, and carrot, and sauté 6-7 minutes or until softened. Next, add the mushrooms, cauliflower rice, poultry seasoning, dried sage, sea salt and black pepper. Stir well and cook for 8-10 minutes over medium-low heat, stirring occasionally. Add the broth, chestnuts, and fresh parsley. Stir well, cover, and cook for another 12-15 minutes or until liquid is absorbed. Lastly, stir in the chopped pecans and serve.